It is my pleasure that Futsal Casa is the best event ever organized by me. Casa Futsal Championship started on 16 April 2009 and estimated to be finished on 15 May 2009. 8 teams registered for the competition: Casanova, Sepak Kang!, Silang Kaki, Hok Piye, Plagiarism, Kinked Demand, Geng Bas Casa, and Geng Kaca Mata. Casa Futsal Championship is the first all-play-all futsal championship in Casa Subang. The championship is aimed to spur up sports habit as well as to tighten the relationship between Casa Subang members. The most wonderful thing about Futsal Casa is it's blog with so many professional reporters (not like that reporter). The blog tells us about match fixtures, match updates, top awards, and interesting, hot and sensible news. There are many interesting videos inside there, too. The idea of Futsal Casa born in Miss Natalie's P4 class. Futsal Casa is sponsored by Sadid (money, merchandise), Anas (software, money), Ustaz Khairy (prize, money). I'm very proud of being in that class, which end up with full controversy. I would like to thank all the CASA members who support the game. Here are the list of the committees. Chess is a game played by two players, who we'll call White and Black. It is played on a board of 64 squares. Each square can be empty or occupied by a piece. The initial position of the game consists of 16 white pieces and 16 black pieces, arranged as shown in the following diagram. Whoa, what I have been talking about? You feel addicted to chess, and you like to play and play. But, you don't want to feel bored with people who take too much time to make a move. You'll be thinking of buying a chess clock? But, you could not find it, or find it expensive. Here is the solution, you just need to download it on your computer. Click here to download for free. 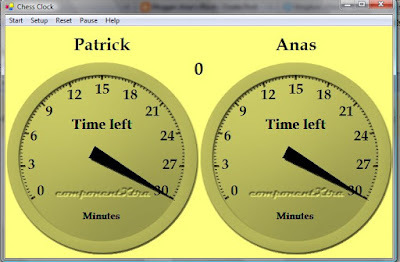 This is the software I downloaded from (already forget the website). You can also find other related software on the internet. When you play with your opponent, switch your computer on and put beside you as in the tournament. You just hit the space bar when your turn is over. You can practice for your tournament also! Thursday would be the official day of quizzes for Ms. Joanne class. However, there was no quiz last week. However, smiles came from most of the students, relieved perhaps. I didn't care much if there was no quiz, but I'm worried those whose marks were in sixties, and seventies. If they really want this mark, they should not be relieved if there is no quiz. However, they would request for more quiz. I admit that Ms Joanne's quizzes were tough, and maybe your marks always decreasing. They should also know that without the quiz, their marks would not go higher. For those who really want marks, this is my suggestion. Work smart in calculus, and always be prepared. Enjoy calculus and the quizzes. Don't avoid the 'obstacle' - the quiz, but accept the challenge. You have to face the challenge to succeed!! For those who really need my help, please inform me. I would not care losing my time for the best of all of us. Sometimes you feel that you have to many accounts on the internet, and you become confused and unstuck in time (Vonnegut 1). 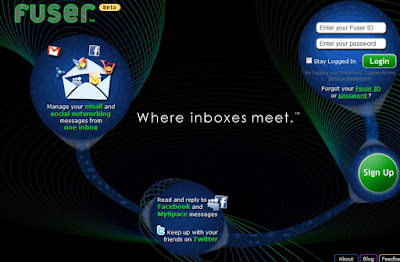 Fuser, is a site that can manage all your e-mails together with your social networking comments, wall posts and messages in an inbox. For example, you get e-mail from gmail and Yahoo! Mail, as well as someone just post something on the wall of your facebook, you'll get all the message inside the inbox in fuser. For social networking, only three services are available - Facebook and MySpace. But, you can post on your friends wall to facebook and write comments on your friends on MySpace from fuser. You can also update you twitter message from there. 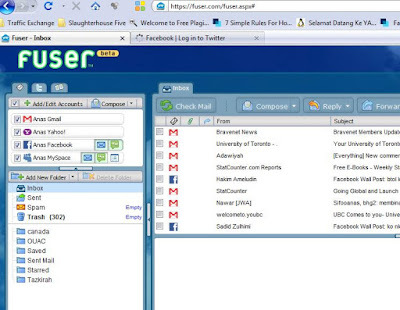 Note that all messages you delete from fuser would also be deleted in your original account. This is a good syncronization. All in all, you may try using fuser, and if you dislike fuser, you may leave comment here to tell others about its limitation.